Label Rouge ducks and ducklings (female) are raised in the traditional duck-rearing regions. Ducklings are usually eaten whole, whereas ducks are usually presented in cut portions because of their weight. Hardy breeds, selected for the quality of their meat. There are two types of roasting ducks: Muscovy ducks and Peking ducks. According to their breed, they may have grey striped feathers or white feathers. Label Rouge traditional ducks are reared in small, well-lit poultryhouses in natural daylight (400 m² maximum per poultryhouse). The stocking rate inside the poultryhouse is 8 drakes per m², and 10 hen ducklings per m². 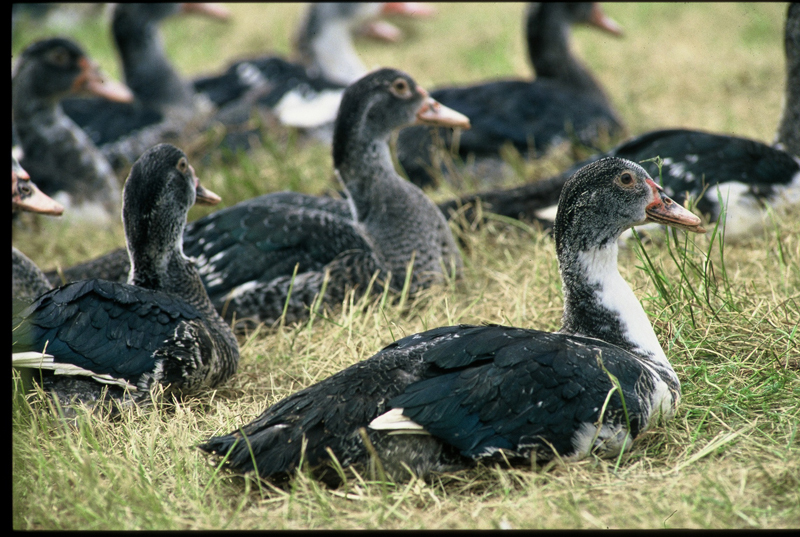 As soon as their feathers are fully developed, they are let outside and allowed access to large grassy and/or shady areas with at least 2 m² minimum per duck. 50 days for female Peking ducks. Label Rouge traditional ducks are class A fowl (European standard pertaining to external appearance) and must therefore be perfect in terms of their presentation. They can be presented partially eviscerated (with giblets), ready-to-cook, or cut up into pieces. As ready-to-cook fowl, their mean weight ranges between 2.3 kg and 3 kg for ducks and 1.2 kg et 1.7 kg for young hen ducks. 17 days maximum after slaughter for cut portions of Peking duck vacuum packed or presented in modified atmosphere packaging (or gas-filled packs).